Margareta Whalström – President, Swedish Red Cross, UN Special Representative for Disaster Risk Reduction 2008-2015. Stuart Corbridge – VC Durham University. Ciro Ugate – Director, Emergency Preparedness and Disaster Relief, Pan American Health Organisation. Eelco Dykstra – 11th Brunel International Lecturer 2016-2018, Institution of Civil Engineers. Dr Amod Dixit – Executive Director, National Society for Earthquake Technology, Nepal. 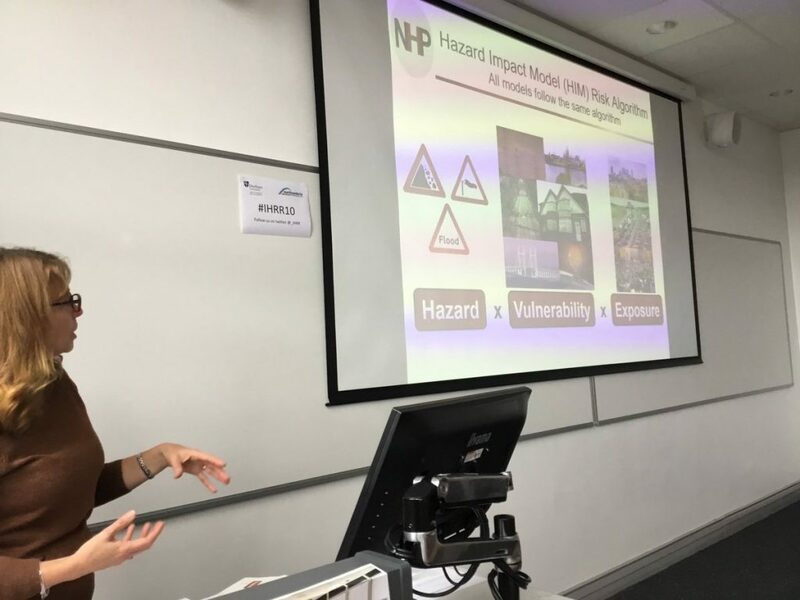 Helen Balmforth presenting an overview of the Natural Hazards Partnerhsip. The conference itself was largely internationally-focused, which wasn’t directly relevant to our current work. However, it did provide a useful global context to situate ourselves in. In particular, the conference highlighted comparisons between disaster risk reduction in developed and developing countries. Many of the features and challenges remained the same (data management, working towards multi-hazard assessment, the importance of impact and risk modelling). However, in developing countries, national resources and the inherent challenges of local and national geography often restrict the ability of the State to act. In these cases, local communities are being given much more ownership over the resilience agenda because outside aid often arrives too late. How to make best use of current services / tools / processes. How to direct people to the most appropriate services available. How to interact with academia and properly implement cutting-edge science. How to present risk information clearly to different audiences. How to understand the general public’s perception of impact and risk arising from hazards and how they consequently react to warnings.